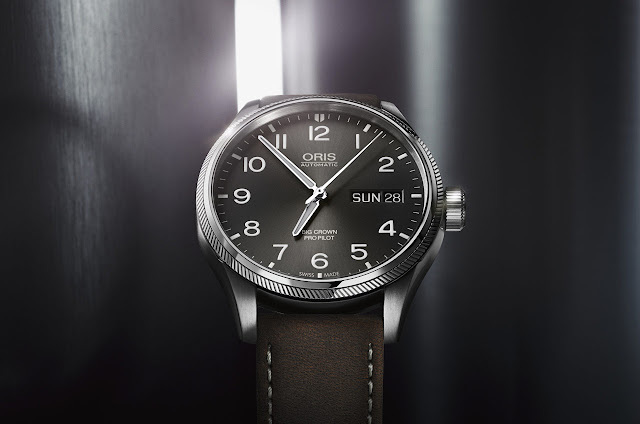 The Oris Big Crown ProPilot Day Date is a watch inspired by pilots but created for everyday life at ground level. Oris has been making pilot’s watches since 1938 when it introduced the first of its Big Crown family. That watch’s crown was far larger than on a conventional wristwatch in order to allow pilots in ice-cold cockpits to wind or adjust the watch without having to take their gloves off. In line with that tradition, today’s Big Crown ProPilot line features an oversized crown, as well as a coin-edged bezel inspired by jet-engine turbines. The 45 mm brushed stainless steel case frames an anthracite dial with an elegant sunray finish and large printed numerals that, like the polished nickel hour and minute hands, are filled with Super-LumiNova for excellent legibility. Inside the Oris Calibre 752 automatic movement, based on Sellita SW 220-1, with day and date at 3 o’clock. 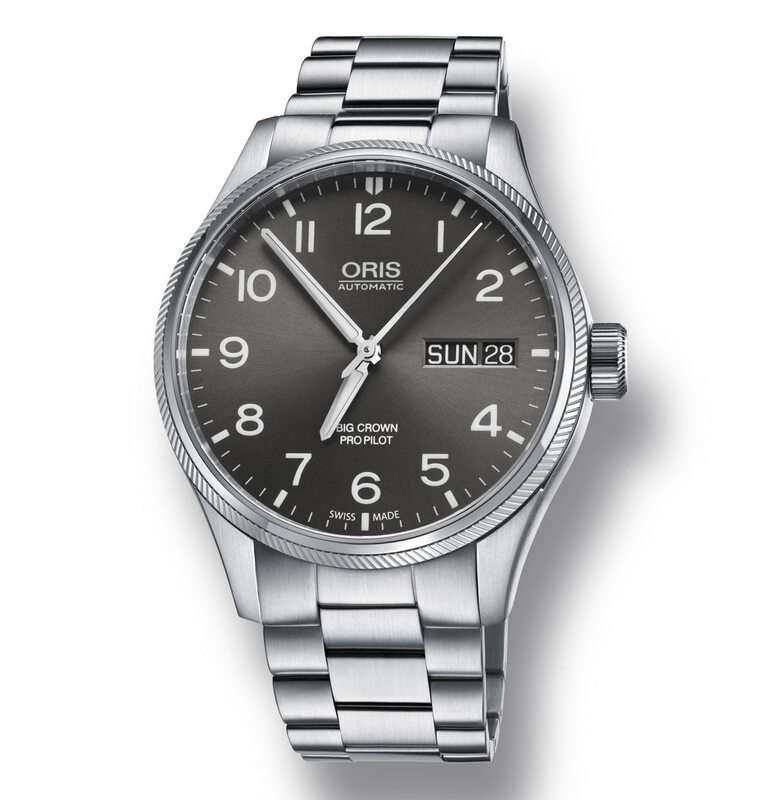 The watch has a mineral crystal case back, through which the wearer can see the signature Oris Red Rotor. The new Big Crown ProPilot Day Date comes with the choice of straps: a vintage brown leather option with beige stitching; a grey leather strap with a crocodile imprint; a more traditional black leather strap; a grey textile strap; or a brushed stainless steel metal bracelet. 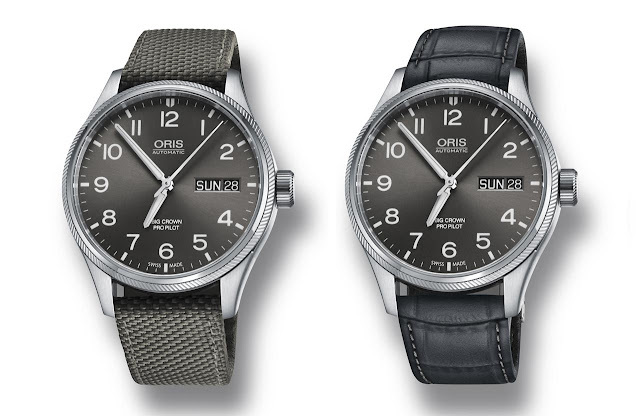 Oris Big Crown ProPilot Day Date. The Oris Big Crown ProPilot Day Date is a watch inspired by pilots but created for everyday life at ground level. 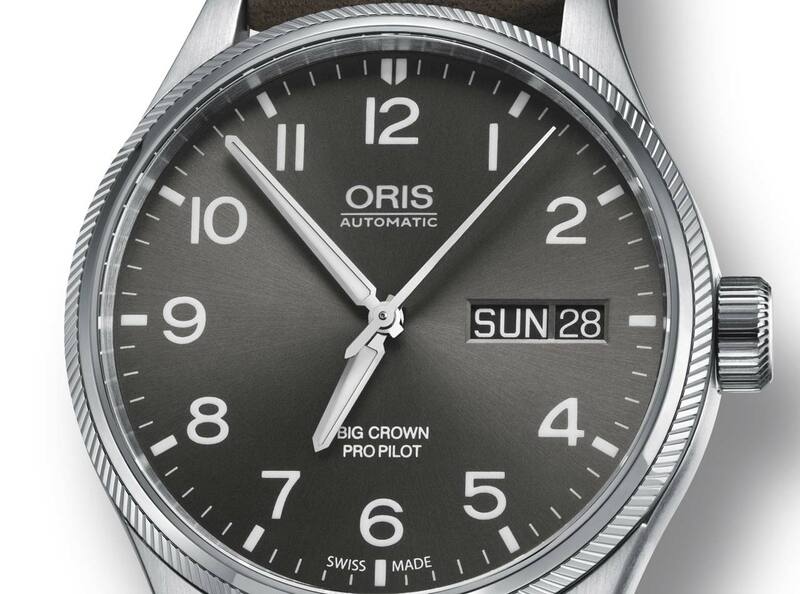 Water resistant to 100 metres / 330 feet, the Oris Big Crown ProPilot Day Date has a price of Swiss Francs 1,650.